All fittings: ropes, wheels, clappers, stays, sliders, were removed first. 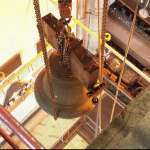 The bells were lifted from the frame using a manual hoist attached to the roof beam, moved across by transferring the weight to the main power hoist, which then lowered them to the ground, through three floors. The bells were moved to the lorry on pallets, using a hand operated fork lift trolley. To make room to lower the larger bells through the bellframe, the centre member had to be removed. In the picture it is still tied at the side of the adjacent bell pit.